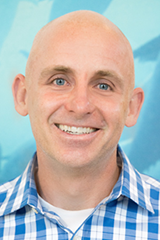 Ken Plasse joined Fishpeople in late 2015 to help steer the company on its path to make Great Seafood Simple through disruptive product innovations as well as using storytelling to connect consumers back to the source of their sustainable fish. Ken has over 15 years’ executive experience building and growing leading-edge products that consumers demand. His proven entrepreneurial acumen and broad functional expertise has yielded revenue and profit growth in a broad portfolio of companies, from start-ups to Fortune 500s. Prior to Fishpeople, Ken transformed a pioneering biotechnology into an award-winning food ingredient division at Solazyme (now Corbion) and headed spirits innovation at E&J Gallo creating multiple $100M+ brands. He developed a deep marketing and sales foundation at Hershey, working in multiple executive roles that culminated in leading Hershey’s premium brands division as Managing Director, where he steered an acquisition consolidation of 3 early stage natural companies into one high-performing business unit delivering robust growth and profitability. Early in his career, he held a number of roles in management consulting and finance. Ken earned a B.S. in Accounting from University of Maryland at College Park and an M.B.A from the Wharton School of Business at the University of Pennsylvania.